What if 46th Special Forces Company Association earned a penny every time you searched the Internet? Plus, it won't cost you a penny! Or how about if a percentage of every purchase you made online went to support our cause? GoodSearch.com is a new Yahoo-powered search engine that donates half its advertising revenue, about a penny per search, to the charities its users designate. GoodShop.com is a new online shopping mall which donates up to 37 percent of each purchase to your favorite cause! Hundreds of great stores including Amazon, Target, Gap, Best Buy, ebay, Macy's and Barnes & Noble have teamed up with GoodShop and every time you place an order, you%u2019ll be supporting your favorite cause. 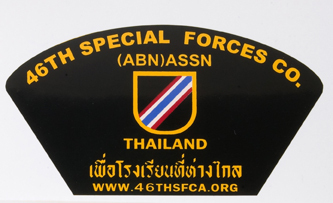 Just go to www.goodsearch.com and be sure to enter 46th Special Forces Company Association as the charity you want to support. And, be sure to spread the word!